Like in May, I processed the downloaded Dotlan data for June 2015. Let's see the ratting charts first: Almost a year ago I wrote an analysis on the correlation of online players and various activities and found that concurrent logins strongly correlate with highsec activities (ratting, jumps, kills), but weakly or not at all with lowsec and nullsec activities. 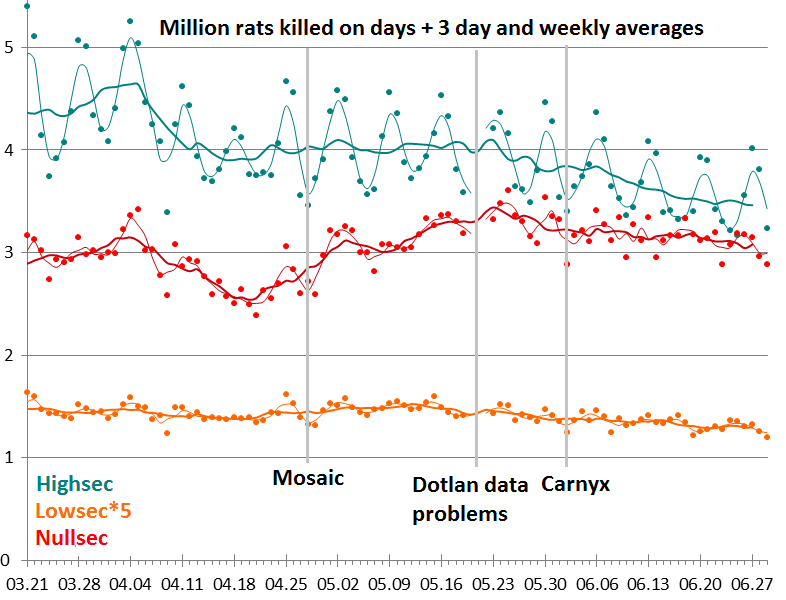 If you look at the chart above and compare it with the doomsaying everywhere, you can see how true it was: as highsec ratting drops, so do the login numbers. Maybe this time CCP realizes that it's not nullsec that needs fixing. Let's see the one-year data: While June was bad for all zones, it's just the summer. As you can see from the trendlines, only highsec activity has permanent problems. Let's see the nullsec regions! 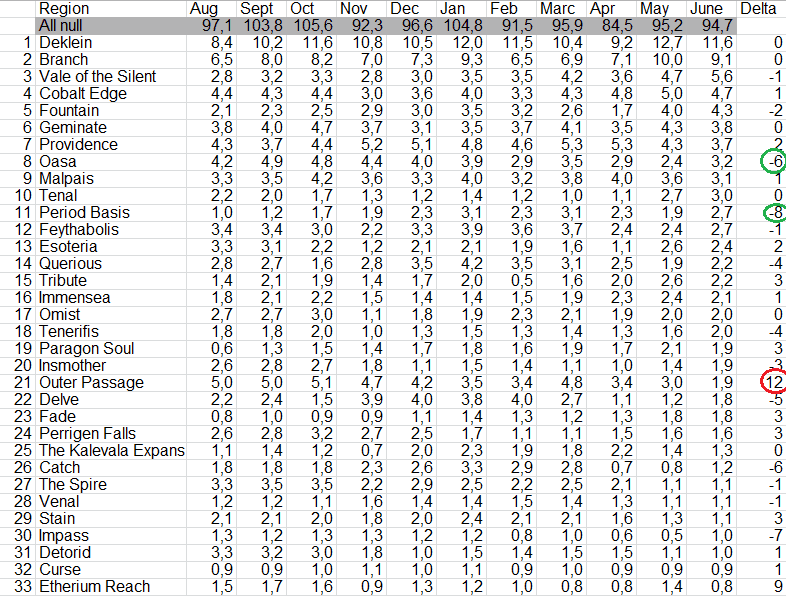 Deklein and Branch ratting are still very high, but lower than the May record. The biggest winners of June were Oasa and Period Basis, while Outer Passage suffered from the SOLAR-Geminate war. 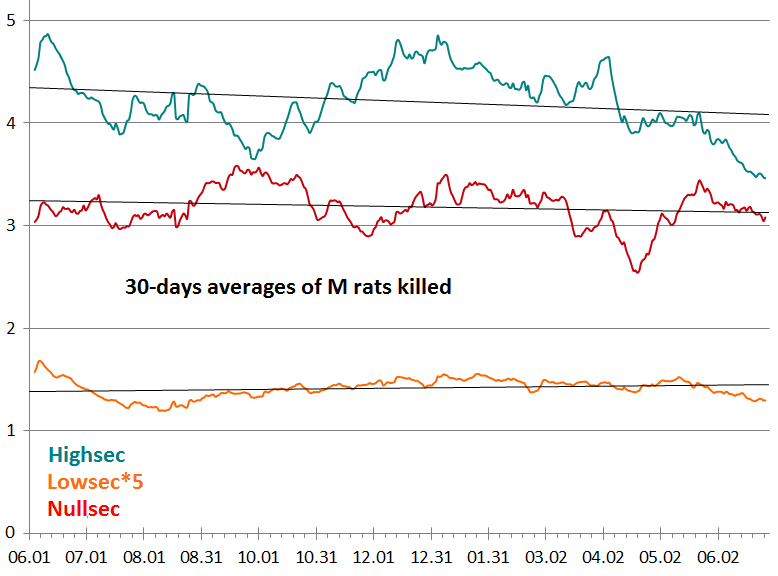 Ratting, the purpose of existence of the Imperium of Evil has decreased both in absolute and relative number since the May record, but they are still high. Let's see the individual alliances: Goons abandoned about 1/4 of their land in two months, since they couldn't hope to keep them against the pirates during FozzieSov, but they actually increased ratting, creating pretty crowded systems, a real gankers paradise. 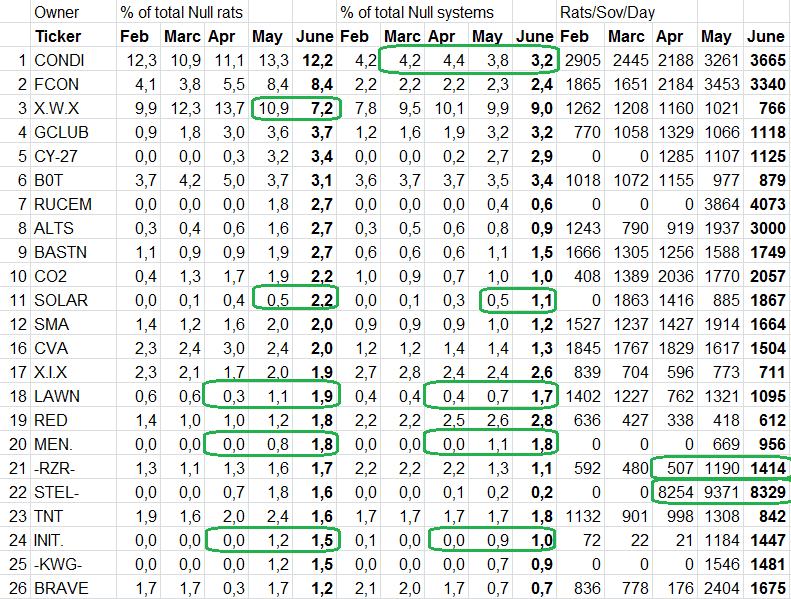 The Geminate renters lost awful lot of rats due to the war, while their enemy Solar gained both rats and land. LAWN was relocated from Pizza-owned Delve to Vale, gaining both land and awful lot of rats. Black Legion didn't have land before, but now they have much and rat on it pretty well. RAZOR got crowded as their holdings condensed. FEDERATION OF INDEPENDENT STELLAR SYSTEMS has a little space, but they rat on them with never-seen density. 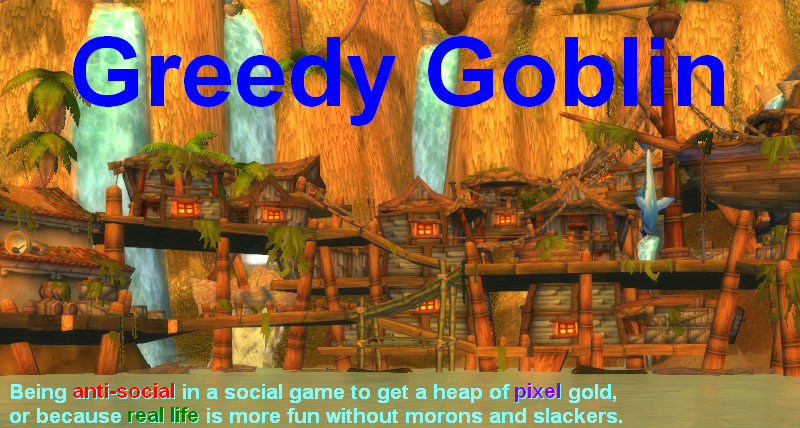 Sanshas are people too, someone plant an AFK cloaker there just out of humanity! Init tried a nomadic life. It didn't work, so they are now back in the Imperium, ratting. PS: what kind of idiot would drop a Revenant on a frigate? A dead idiot! The revenant dropped on a titan, it just lost since the titan was bait. I know. I just wanted to show that he dropped on everything carelessly, including frigs. I'm confused. He dropped on the titan, frigs just happened to be there. There's nothing idiotic about losing, he simply made a call that didn't pay off. I'm sure you've had times where you've lost isk trading, it's just part of the game. As far as idiots go, this guy is pretty far down the ladder. He dropped the most prized thing on the strongest thing. He made a call that couldn't in a million years pay off. That's the definition of an idiot. "He dropped the most prized thing on the strongest thing. He made a call that couldn't in a million years pay off. That's the definition of an idiot"
If the Titan had not been bait, would you still say it was idiotic? Post hoc idiocy is always easy to call. And either way, he still did not "Drop a rev on a frigate", but "Super drops on Titan" would not make for such a good tagline. The frigate died a month ago. He dropped on a frig, period. Had the titan been not a bait, it would likely win against a revenant assuming not completely retarded fit and pilot.